You will get ONE of the designs you choose from the 'Style' drop down at the size you select. See Listing Photos for the design number. Dimensions for each size are located in the ‘Size’ drop down option. They represent the image as you see it in the photo from the extreme boundaries... top-most to bottom-most and left-most to right-most points or vice versa. Sizes with 1 dimension represent the height (or diameter if applicable). The size you need is relative to the project you are working on. ALWAYS, measure for your project at hand. For Measuring and Sizing Suggestions, see Note 17 in the Additional Policies and FAQs. Unless otherwise noted in the SHAPE SPECIFICS area above, we use ¼” Baltic Birch Plywood for our laser cut wood pieces…perfect for crafting. For more, detailed information, see 'Additional Policies and FAQs' in the 'Shipping and Policies' Tab above. I suppose it was just a matter of time. This has been 6 months in the making, but we are anxiously loading the AnneLayneMetalArt shop with yard art, wreath/metal-art door hangers, wall hangings, etc. Custom Designs are also welcome. We can brake metal and weld metal, so your ideas are endless as to what we can do for you! We can guarantee that your order is shipped out the next business day. We will put your order at the top of the queue-- first in line to be cut and shipped on the next business day. ●1● If you need holes in the piece you are purchasing, that is easily accomplished. Please tell me that in 'Add a note to AnneLayneToo' section **AT CHECKOUT** and tell me 1 or 2 holes and where you want them. Where, EXACTLY, do you want Hole 1? Where, EXACTLY, do you want Hole 2 (if needed)? If you ask for 1 hole, BE SPECIFIC as to where you want the hole if the piece you are purchasing does not have vertical symmetry (right and left sides match if the shape is folded in half). Typically, 2 holes are put in irregular shaped pieces to allow you to adjust your hanging apparatus for level hanging of unbalanced pieces like these. 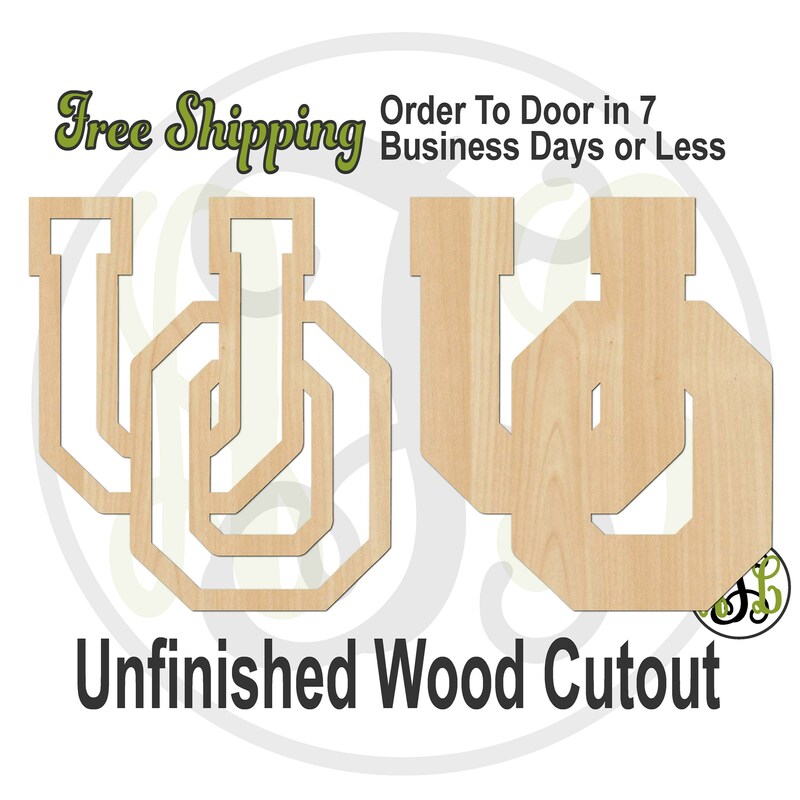 we can place it on the top center of your wood cut out as long as it is a circle, square, rectangle, or symmetric shape provided that shape gives us space at the top to add the slot. Please tell me that in 'Add a note to AnneLayneToo' section **AT CHECKOUT**. If a message is sent after the purchase, I can't guarantee it will be read prior to cutting and packaging as things move fast around here, so make sure to put your request in the notes when you checkout. Also, if we are not told a specific location for the holes, we will place them where we feel is best. If where we think is best was not what you envisioned, this does not warrant a refund. There is no charge for this. YES. It is FREE!! Click on the link below to access our shop homepage where you will find over 1900 of the most AMAZING designs that will satisfy a variety of your DIY interests. Fast Free Shipping...We ESTIMATE your purchase from order to door in 7 business days or less (see Shipping Policy #4 for details) for all items delivered within the contiguous continental US. We will ship to Alaska, Hawaii, APOs and the US Territories, HOWEVER, there is an additional shipping fee associated with purchases to those areas. Please use the link below as an add-on to your order if your destination address is in any of these areas. You will receive a tracking number once your items have shipped. We ARE NOT responsible for UPS/USPS/FedEx delays in shipping. Should you have concerns with regard to your package shipment timeline, please direct your inquiries to UPS (1-800-742-5877) / USPS (1-800-275-8777) / FedEx (1-800-463-3339) and let their experts help you. We are certainly not the expert in their business, so we will always defer to them to answer their shipping questions. Please check the Shop Announcements (under my shop banner) for any shipping delays due to short-term shop closures or the Holiday hustle-and-bustle that there might be during your purchase period. We are collaborating with other Etsy Shops so that you can get your AnneLayneToo wood art delivered to you completely finished. Go to my SHOP POLICIES> Additional policies and FAQs> No. 19 for details. Are you interested in 16% off your entire next purchase and going forward, 20% off 1 item or 30% off 1 item coupons? Here's how you can get them...go to my SHOP POLICIES> Additional policies and FAQs> No. 16 for details. ANY Designs, Graphic Images, and Photographs found in my listings and in my shop are the property of AnneLayne. I do not allow my designs to be copied in any form for resell. You may, however, purchase my listing, take the unfinished piece and create a whole new level of fun and interest, and resell it in your Etsy shop, at a craft fair, gift-it to a special someone, use it for an event, or keep it for yourself. (2) All sales are final. (3) Since all items are cut to order, no refunds or exchanges are allowed...even if USPS is at fault (see Shipping Policy #4). (4) I do not accept cancellations if your order has started the design/cut process, and this can happen from 30 minutes to 24 hours after you have placed your order. Priority Mail and First Class Mail through USPS and shipments by UPS are NOT GUARANTEED services. That means the delivery-time quotes given to us are estimates ONLY. We recommend that if you need your purchase earlier than our '7 Business Day' estimate, you contact us first to have it delivered Priority Mail Express®. Please be aware that USPS is very proud of this service, so it is VERY pricey. It can be upwards of $35-$150+ depending on the weight, purchase price and destination of the items being delivered. However, this is USPS's guaranteed service and your best chance to get your order in the time you need. Please be aware that if USPS faults on your order delivery time, even with Priority Mail Express®, there are NO REFUNDS on the items you have purchased through this shop. I will, however issue a refund on the Priority Mail Express® service since Priority Mail Express® comes with a money-back guarantee. Up to this point, USPS has been GREAT... no blunders on Priority Mail Express®, and I don't anticipate anything going forward. Oversized orders are shipped by UPS as USPS can not handle those orders. Oversized orders are typically those whose longest side is greater than or equal to 35". These pieces will take an additional 2-4 days for packaging, processing, and pick-up for shipment. a) Take a CLEAR photo of all the packaging that was around your piece. b) Take a CLEAR, CLOSE-UP photo of the shipping label. c) Take a CLEAR photo of the whole item on the box so that the shipping label can be seen. d) Take a CLEAR, CLOSE-UP photo of the point of breakage. e) Send all 4 of the photos to me through convo. f) Once we have received these photos, your new piece will be cut and shipped. (3) If your item is returned back to us due to shipping issues or an incorrect address on Etsy, you will become responsible for additional shipping to the updated address. (4) To clarify...There is Free Shipping and order to door in **7 BUSINESS DAYS** or less as an ESTIMATE ONLY for all items delivered within the continental US. WOWZA---FREAKY FAST & FREE SHIPPING!!! Orders to Alaska, Hawaii, APOs and the US Territories will have an additional shipping fee and can take 5-7 days longer. Please see this listing below to purchase the additional shipping charges associated with the number of pieces in your order. The '7 Business Day' estimate is for quantity purchases of 20 or 200 Minis or less. Purchases that exceed 20 pieces or more than 200 Minis may take 1-3 Business Days longer for every 10 pieces or 100 Minis thereafter. In other words, orders of 28 pieces (or 225 minis) may take 8-10 business days, 35 pieces (or 350 minis) may take 11-13 business days, etc. Shipments to APOs are blind shipments. USPS provides NO TRACKING. I will happily ship to the EXACT address that you provide, but I have no way to know where it is or when it might get there. I am not responsible if your item gets lost in the mail and does not make it to the destination address you have provided nor do I offer refunds should USPS misplace your package. We are a small operation. Our "Business Days" are Monday - Friday. If you place an order on a Thursday, Friday is the first business day (THE WEEK DAY...M-F... AFTER THE ORDER IS PLACED IS THE FIRST BUSINESS DAY). You will have 2 weekends (Saturday-Sunday) of non-business days that are possible during this shipping time period in this example. Also, we *do* *not* PROMISE or GUARANTEE your order in **7 Business Days**. We ship MOSTLY Priority Mail & First Class through USPS which are NOT GUARANTEED services; therefore, we can not guarantee what is not guaranteed to us. That time-frame is an estimate based on the fact that our processing time is fast, and Priority Shipping times, with NO INTERRUPTIONS, are fast as well. We usually have your order ready for shipment in 1 to 2 BUSINESS DAYS when drafts or revisions are completed prior to the purchase. Once the item is out of our hands, we rely on USPS to get it to you within the time they quote us, which is usually 2-5 business days. If your order time is close to any major holiday, during a holiday season (10/1 to 12/31), any bad weather condition, or we are still completing revisions of your wood art, expect delays of 1-3 days in processing times. Our order volume increases, USPS gets busy, mother nature has her own plans, and extra revisions after a purchase will delay shipments or the time it takes to be cut and shipped. We have had only good luck with USPS & UPS, but we feel the need to state: Please be fair to the review, and rate us on OUR quality, service, and speed, and not the mishaps of USPS/UPS should they mishandle your purchase or there be any delays during holidays or extreme weather. Etsy provides you with a shipping notification to track your package and view your receipt of purchase should you need to refer to the details of your order to make sure we maintain the standards within OUR control. Priority Mail and First Class Mail through USPS are NOT GUARANTEED services. That means the delivery-time quotes given to us are estimates ONLY. We recommend that if you need your purchase earlier than our '7 Business Day' estimate, you contact us first to have it delivered Priority Mail Express®. Please be aware that USPS is very proud of this service, so it is VERY pricey. It can be upwards of $35-$150+ depending on the weight, purchase price and destination of the items being delivered. However, this is USPS's guaranteed service and your best chance to get your order in the time you need. Please be aware that if USPS faults on your order delivery time, even with Priority Mail Express®, there are NO REFUNDS on the items you have purchased through this shop. I will, however issue a refund on the Priority Mail Express® service since Priority Mail Express® comes with a money-back guarantee. Up to this point, USPS has been GREAT... no blunders on Priority Mail Express®, and I don't anticipate anything going forward. A request for EXPEDITED SHIPPING will come with our EXPEDITING FEE plus the EXPEDITED SHIPPING COST. Our fee is non-refundable. I urge you, do not cut your time to order too close to the time you need the pieces. It can and has happened once before that USPS does not deliver on time, and THERE ARE NO REFUNDS ON YOUR PURCHASE FOR USPS MISHAPS OR DELAYS (see Payment Policy #3 and Refund Policy #4). Be advised that typically, USPS/UPS will leave these packages at your door ,or if they are small enough, in your mailbox. At no time does it become our responsibility if USPS/UPS shows that the package has been delivered, and it comes up missing. Most times, other family members have captured the packages, and brought them inside, but stranger things have happened. Please make sure that the address you give through Etsy for delivery of your package is a safe place to leave your items. THERE ARE NO REFUNDS/RECUTS FOR YOUR PURCHASE ONCE THE ITEMS SHOW TO HAVE BEEN DELIVERED. Also, you can contact your local USPS/UPS facility who will check with the driver for verification of where they have left the package. Contacting them directly is a great problem solver/package finder in most instances! USPS/UPS often changes their expected delivery date while your package is in transit if they foresee there are schedule conflicts/changes that will prevent them from delivering your package on time. This happens quite often and is the reason it is not a guaranteed service. If you are use to receiving your package in 3 business days and 6 business days passes without having received your package and you just need to know where it is, please contact USPS (1-800-275-8777) / UPS (1-800-742-5877) directly with your tracking number. We will always defer to USPS/UPS to answer their shipping questions as we can't see any thing more than you can via their tracking system. You may also try contacting your local post office to see if they may be able to locate your package. USPS/UPS's magic number to start a search for a package that has not been delivered is 10 DAYS after the day it was picked-up from us and 14 DAYS is the magic number for 'lost packages'. We will not get involved until 10 days has passed. If your package has not been received after 10 days has passed, please contact us at that time so that we can advise USPS/UPS of the situation, and we will be happy to look into the situation. If after 14 days USPS determines that the package has been lost, we will re-cut and re-ship your order OR issue a refund. WE ARE NOT RESPONSIBLE FOR SHIPPING ISSUES WITH EITHER OF THESE COMPANIES. We use their service and pass no additional cost to you. Please address your shipping issues directly with their customer service representatives when your expected delivery times and their delays are within 10 days of pick-up from our shop. That is what they are there for. Once the package is out of our hands, we have absolutely no control of this part of the process, and that is why we provide you with tracking information should you need it going forward. PLEASE CONTACT US TO IRON OUT THE DETAILS, QUICKLY, IF YOU NEED THIS OPTION, AND I WILL CREATE A PRIVATE LISTING TO INCLUDE THE PRICE OF THE WOOD-ART PIECE(S) AND YOUR EXPEDITING FEE(S). THERE ARE TIMES HERE AND THERE WHEN WE WILL NOT BE ABLE TO EXPEDITE ORDERS. WE WILL LET YOU KNOW UPFRONT IF YOUR REQUEST IS WITHIN ONE OF THESE TIME FRAMES. (1) We do not refund for any items that have been damaged or lost in transit, nor do we refund if your address on Etsy is incorrect. We will, however, REPLACE any damaged or lost items caused by shipping. Please see Shipping Policy. (2) If your item is returned back to us due to shipping issues or an incorrect address on Etsy, you will become responsible for additional shipping to the updated address. There are no refunds should you decide you do not want it. (4) Since all items are cut to order, no refunds or exchanges are allowed...even if USPS is at fault (see Shipping Policy #4). (5) I do not accept cancellations if your order has started the design/cut process, and this can happen from 30 minutes to 24 hours after you have placed your order. 2) To insure that the requester is serious about purchasing a custom sign and has a clear understanding of the time it takes in this design process, this custom design work will only be started once we have discussed the small details, sizing, and I have received payment for the custom order request. 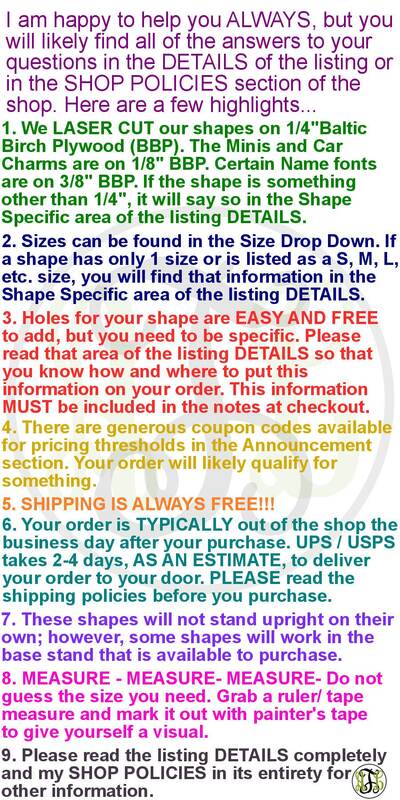 3) We try to have all your questions answered in the listing prior to purchasing your item. If you read the listing, and still have questions, please don't hesitate to convo me. 4) The images in the listings are graphic renderings of my designs. To get an idea of how the pieces will look cut, check out the 'Updates' and 'About' Sections of the shop for photos of some designs that have been cut. 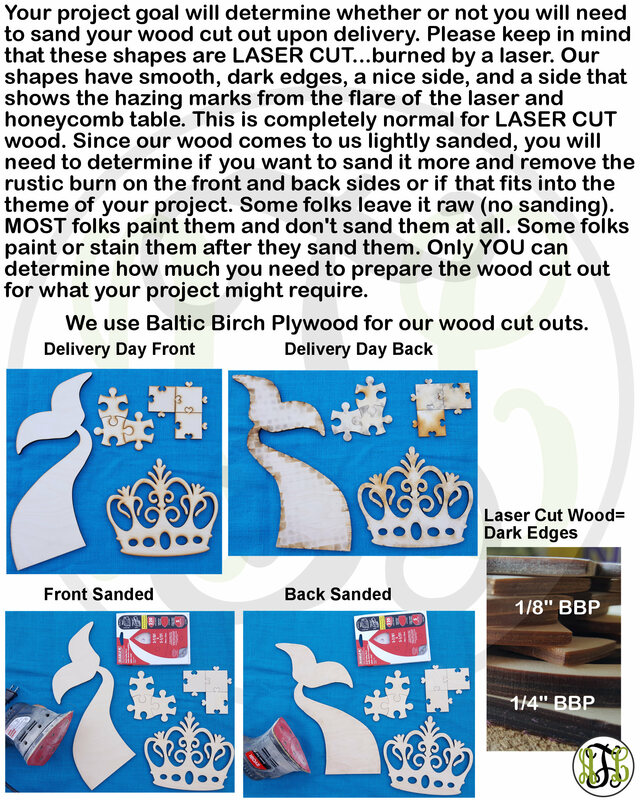 6) If you are new to purchasing laser wood cut pieces through this shop, or any other shop for that matter, please be aware that laser cut wood is burned by the laser. That is what produces the dark edges and the smell of burned wood. Also, because we are so fast from laser to packaging, we don't give the piece much time to "air-out" before it is shipped, and it traps the smell in the packaging. The back side of the cut piece will show the hazing marks from the laser (sanding it a bit more once you get the piece will remove the hazing marks completely). There is nothing unusual about any of this, should you have concern. These pieces are made to be finished in some way. Once you finish your laser cut wood piece, you will have eliminated the dark edges, hazing on the back, and the smell of burned wood. I give you this information so that you will have complete transparency with regard to what you will receive upon delivery so that you can make an informed decision about whether or not laser cut items will suit your needs for your project. It might not, and that is ok, but at least you will know if you can work with the items being sent for your project needs. I offer NO REFUNDS. This discoloration/hazing (may look like finger smudges or sometimes even marks from the honeycomb table) is completely normal on laser cut wood pieces. 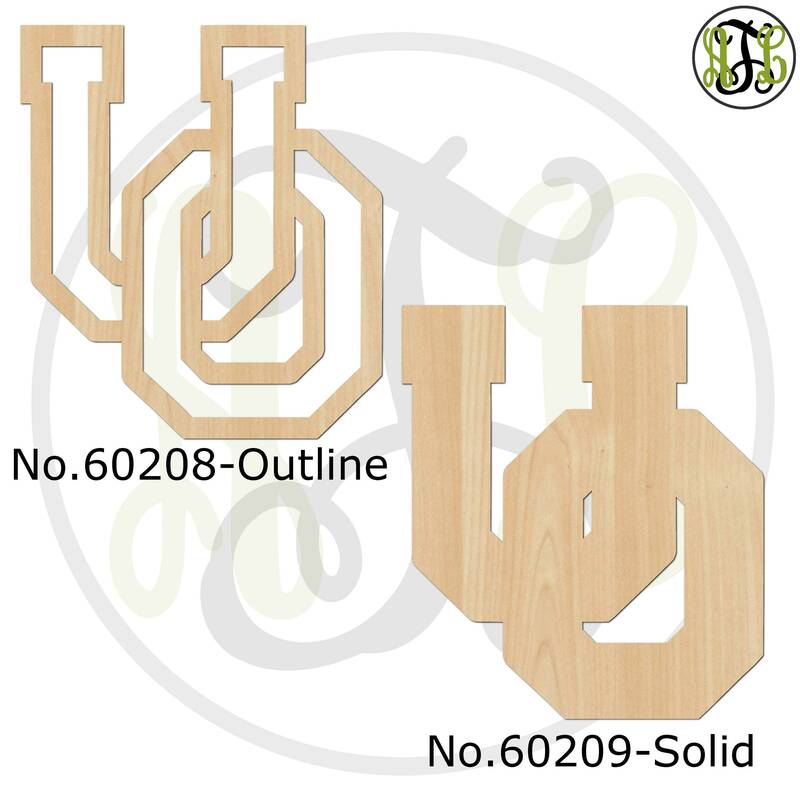 Copy and paste the link below to go to my write-up with pictures on "What to expect upon delivery of your laser cut wood piece"
7) This shop caters to CUSTOM LASER CUT WOOD pieces. I love designing OOAK pieces for you to display. However, please be aware that the laser cut wood designs that are custom cut for you, can be very fragile, especially where the design lends itself to narrow cutting. We try to stay away from anything narrower than 1/4" on the design face, though sometimes that can not be avoided. That being said, it is very important for you to handle your purchase with care when you open the box as well as when you are hanging your laser cut artwork. If you bend it, twist it, drop it, mishandle it, or it falls off of something at any height, expect it to break...1/4" Birch Plywood is not unbreakable. At no point does it become our responsibility if you break your piece. 8) I take Etsy's Anti-Extortion Policy very seriously, and so does Etsy. It is your responsibility that pertinent information that is openly provided to you, the customer, not be overlooked and be read thoroughly. This information is provided to you so that the bill of sale is completely transparent, and you know what you will be receiving when the item arrives at your door. This is especially the case with custom orders. This situation becomes evident when your desire to give a poor review is based on information that shows you have overlooked or not taken the time to read the listing. I will report any review that seems to promote "I'll give you a good review if..." mentality (in other words, the threat of a bad review unless a demand from you...for your gain of a replacement or monetary discount/ refund...is met by me because you did not take the time to read the listing). This type of activity destroys the integrity of the Etsy Marketplace, and it will not be tolerated. TO DATE, I HAVE RECEIVED 4 POOR REVIEWS, AND ALL OF THEM STEMMED FROM THE PURCHASER NOT READING THE LISTING AND SHOP POLICIES. ALL THIS INFORMATION IS HERE TO BENEFIT YOU IN MAKING AN INFORMED DECISION ABOUT YOUR PURCHASE. PLEASE USE IT TO YOUR BENEFIT. 9) I recommend doing your homework for the perfect size you are looking to purchase for the area you want to cover prior to purchasing your wood art. Grab a ruler, tape measure, yard stick, or a combination thereof, and mark the dimensions with some painter's tape on the area you wish to place the art to give yourself a visual representation of what you need. And please read the listing description so that you know what to expect when your wood-art arrives. Your understanding of sizing and materials we use depends on your reading the listing descriptions and these policies in their entirety. 10) I am always happy to show a custom name (or monogram) mock-up for any name/phrase/monogram in a specific font. HOWEVER, I can not possibly design every font that I have listed for a single name/phrase/monogram. My limit is 4 Mock-ups for a given name/phrase/monogram. If you are undecided about several fonts, look at letter structure of notable Capital Letters in your name/phrase/monogram and compare them to what you have in mind that you wish your name/phrase/monogram to look like. I assure you, you will be able to eliminate several fonts this way to make it easier to select the final fonts you want to see. 11) Your purchase of the wood art does not come with ribbon, hangers, or saw tooth brackets. Your purchase contains only the wood piece. If I may suggest, however, OOK makes a hammer-in, saw-tooth bracket that I have used on nearly all of the pieces that I hang on my wall or given as gifts. Tacks and twine are also great materials for making hangers on the back of the wood pieces. At most, 75% of your invited guests will attend your wedding reception. a)1/2 of your guests will only sign their name. They will use approximately 1/3"x3" of the space per signature. b) 1/4 will leave a 1 line message and their name. They will use approximately 2/3"x3" of the space per signature. To get the proper size of the piece that you need for your guest book, my drafting program will calculate the actual square inches on the face of the piece you are looking to use for your guest book, and we can stretch and condense according to what we have figured out that we need for your piece. 14) ANY Designs, Graphic Images, and Photographs found in my listings and in my shop are the property of AnneLayne. I do not allow my designs to be copied in any form for resell. You may, however, purchase my listing, take the unfinished piece and create a whole new level of fun and interest, and resell it in your Etsy shop, at a craft fair, gift-it to a special someone, use it for an event, or keep it for yourself. 1. You need to have a shop on Etsy that sells items where these wood pieces are part of the sold end product in some way...wreath, door hanger, cake topper, etc. 2. Communicate with me, via Etsy messenger, on the pieces you want so that I can make a coupon specific for you. You must purchase at least 6 items or more on this purchase and purchases going forward, but the coupon will be good for all future purchases...new items you wish to list and repeat purchases. 3. When you create a NEW listing in your shop from one of the pieces you have purchased from AnneLayneToo, you will have 21 days to list those new items as finished pieces in your shop and give credit to AnneLayneToo for your cut outs used in your listing. 4. ONLY ON YOUR NEW LISTINGS IN YOUR SHOP... from your purchases from AnneLayneToo, you will need to send me the listing link so that I see where credit was given. If you can't get them in your shop by 21 days, please communicate with me. 5. This is a new offer I'm trying. These details may change at anytime as we experiment with this offer. 1. Write a review of your purchased piece and submit a photo of your finished piece in the review. 2. Send me a conversation through Etsy saying that you allow me to use this photo as part of that listings photos as well as any marketing that I might see a fit use for this photo (usually online sales campaigns). I will put your Etsy user name on the photo before I list it just as it appears in your review. 3. I will create a 20% off coupon to use on your next purchase of 1 item. (1 Coupon good for 1 item). 4. I have no limit, at this point, on the number of coupons you can claim, except you can get only 2 coupons per design and each has to be finished in completely different ways. 5. This is a new offer I'm trying. These details may change at anytime as we experiment and fill our listings with photos. 1. This coupon requires a How-To video that I will post to my YouTube page. Before you purchase your item, let me know what item you are purchasing and what you will be showing in your How-To video. I will have to approve it first. 2. Your video must mention AnneLayneToo at least 3 times as well as the item and item number you purchased. Better if you put it in words on your edited video! 3. Create your video and send me the link or a way for me to download the video via a conversation through Etsy saying that you allow me to use this video for my Etsy shop YouTube collection. 4. I will create a 30% off coupon for you to use on your next purchase. If you wish to create another video to get another coupon, make sure to get me to approve your project first. I don't want too many How-Tos for the same project type. 5. I have no limit, at this point, on the number of coupons you can claim. You can do as many of the videos that you wish on the same design, but it must be a different project each time. 6. This is a new offer I'm trying. These details may change at anytime as we experiment and build our YouTube How-To page. 1) The size of your piece you need is relative to the project you are working on, that is why I offer so many sizes. Take measurements ● BEFORE ● you place an order. It is too late to realize that it is too small or too big once it has been shipped. 2) Yes, 2” is very small, and it will also NEVER appear as though it is 12”. Do not try to visualize a size in your mind…that NEVER works out. Draw a sketch on paper of the size/boundaries you think will work for your project, then take out a ruler and measure it. You can also put painter’s tape on the wall/door to create boundaries for sizing, then measure your boundaries. From there, order the closest size (up or down, your choice) to your measured sketch/boundary. 3) If you are ordering minis that you will be writing on (for a wedding guest book for your guests to sign, etc. ), 1” is too small. Assess the shape. If the design dips inward to the center to a significant degree, like the starfish, you will want to do 3” shapes. If it is an open shape, like a square or circle, 2” should be fine for a name. If you want to be able to put more than a name on the shape, you will want to go up a size or 2 from that. 4) Here are some TYPICAL STANDARD dimensions and ordering recommendations. To set the piece on the floor and lean it against the table, the piece/Letters + any stand that you will set them in will need to add up to be the height of the table or just a ½” less. 19) DO YOU NEED YOUR WOOD ART FINISHED FOR YOU? Here is a list of Etsy Shops that have agreed to collaborate with me so that you can get the best of both worlds-- a nicely designed wood-art piece completely finished to your liking. A) You will search my shop for the item you want finished. ● Tell them the SIZE of the piece you are interested in as it is listed in the drop-down menu that corresponds to the price from that listing. ● List the color(s) you wish to have your finished piece completed. ● Tell them other details like if you want a bow/no bow, ribbon, twine, etc. C) The 'COLLABORATING SHOP' will contact you immediately to fine-tune the details. Once all the details have been discussed, they will create a private listing for you in THEIR shop for you to purchase. D) The 'COLLABORATING SHOP' will order the piece you have selected from my shop, and it will be shipped directly to them for them to finish based on your communications with them. E) Once they are finished painting and decorating your item based on the request you have given them, they will ship it to you. You will then have your own AnneLayneToo designed wood piece beautifully finished by a 'COLLABORATING SHOP'. We stand behind our work, and we hope you see the added value in this, and continue to shop with us.